The Channel Islands are located just off the coast of Normandy and combine British influence with a little French flair. The archipelago is a British Crown Dependency and is made up of six inhabited islands, with Jersey and Guernsey being the largest. Due to them lying in a north Atlantic gulf stream, the islands enjoy a slightly warmer climate than the British mainland and attract tourists all year around. Their location also makes them easily accessible by ferry from ports on the western French coast as well as the south of England. With the biggest populations and the best established commercial centres, the main islands of Jersey and Guernsey are naturally the easiest islands to get to by ferry. Condor Ferries provide crossings for passengers and vehicles to St Helier in Jersey and Guernsey's capital St Peter Port from England and France as well as to each other. Manche Iles Express provide passenger only crossings from Carteret, Granville and Dielette to both Jersey and Guernsey, while there are is also an irregular service to the most northerly Channel Island, Alderney, from Dielette. Each of the islands has a special mix of awe-inspiring scenery, culture and history. 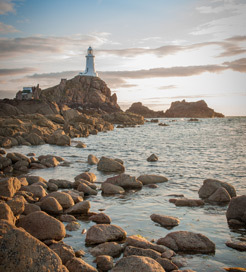 As you would expect, Jersey and Guernsey are the main destinations for those hoping to enjoy a short break as well as people looking for a longer holiday. Jersey has a history that spans more than a millennium and ownership of the island has changed between the French and the British many times. This has led to a blend of cultures that makes it a truly unique place. Key attractions on the island include the Elizabeth Castle, a 16th century fortress that stands on an islet and can only be accessed on foot when the tide is out; and the Jersey War Tunnels, an underground hospital and tunnel network constructed during the Nazi occupation that now serves as a museum. Guernsey's major attractions include La Vallette Underground Military Museum, another subterranean German complex; and Hauteville House, the residence of the famous French writer Victor Hugo during the time he was exiled from his home country. While being much smaller than Jersey and Guernsey, Alderney also has much to see and do, including an island museum and the Alderney Rail road.